Dr. Smith's ECG Blog: Wide complex tachycardias: 2 cases. What is the diagnosis and management? Wide complex tachycardias: 2 cases. What is the diagnosis and management? This is the most widely misunderstood problem in Emergency tachydysrhythmia care. There are many textbooks and articles and preparatory tests that get this wrong. So read carefully! This is a 37-year-old male who states that he has paroxysms of chest palpitations which usually last about 15 minutes and get better with cough or changes in position. The previous evening at approximately 11 p.m., he began to have chest palpitations which lasted through the night until the morning of admission. Along with these palpitations, he had some headache with dizziness. He denied any chest pain or shortness of breath. He did admit to crack cocaine use over the past several days. There are no p-waves. The rate is 180 and constant. It is regular. It is wide. What are the treatment options in the ED? This is a case that comes courtesy of Dr. Kyuhyun Wang (long time Hennepin EKG wizard and my mentor, now at the University of Minnesota). It is from his marvelous Atlas of Electrocardiography, with permission. --Since it is not irregular, it cannot be atrial fibrillation. --The QRS does not look like any recognizable aberrancy (briefly, it does not look like RBBB or LBBB. Furthermore, the first 40 ms of the QRS is conducted slowly, unlike SVT with aberrancy). --AVRT is a reentrant rhythm that goes down an accessory pathway (bypass tract), causing a wide complex, and up the AV node; therefore AV nodal blockade (adenosine) will terminate it. Thus, adenosine is safe in a patient with this ECG (whether VT or ART) and usually will terminate the rhythm if it is AVRT. --Of course, one can also use electricity, but that requires sedation and is not required unless adenosine fails (and one should try 6mg, then 12mg, then probably also 18 mg before it is true failure). If the patient were unstable, which he is not, then one would immediately use electrical cardioversion. Re-entrant tachycardia in WPW, whether orthodromic or antidromic (AVRT), usually starts with a premature atrial beat (PAC) that is able to go down one of the tracts while the other is still refractory. In this case, cocaine may have contributed by leading to a PAC. There is sinus rhythm with a very short PR interval and widespread delta waves. This confirms that the first ECG was antidromic reciprocating tachycardia. There are secondary repolarization abnormalities (ST depression) very typical of WPW. This is irregularly irregular. Only MAT and atrial fibrillation are irregularly irregular. Since there are no p-waves, this is atrial fibrillation. There is a wide complex. Atrial fibrillation with a wide complex can be atrial fib with RBBB or LBBB or nonspecific intraventricular conduction delay, but these do not have extremely short R-R intervals and do not have multiple QRS morphologies. The post cardioversion ECG of the second case is unavailable but might look similar to the one above, depending on the location of the bypass tract. Marill KA et al. Adenosine is safe and effective for differentiating wide-complex supraventricular tachycardia from ventricular tachycardia. Crit Care Med 2009 Sep 37:2512. There are those who warn that if you give adenosine to a wide complex tachycardia thinking it is AVRT or SVT with aberrancy, but it is really adenosine responsive fascicular VT, that it will convert and you will miss the diagnosis of VT.
3) all patients will get a follow up in any case. 1) Any fast rhythm which worries you may be treated with electrical cardioversion. If confused, use electricity. If the patient is unstable, use electricity. 3) In regular tachycardias due to WPW (even wide ones! ), AV nodal blockers are safe and effective. They block the limb of the re-entrant rhythm which goes through the AV node, thus interrupting the circuit. 4) Atrial fib with WPW is very recognizable: there are bizarre QRS with multiple morphologies, and very fast rhythms with short R-R intervals. If you can find any R-R interval shorter than 240 ms, then AV nodal blockers are definitely dangerous. I've been following adenosine use in WCT closely and had read a reply to Marill (J Emerg Med vol 38, iss 1, jan 2010) that noted only 1 patent had WPW in the study. How should this change our interpretation of the results, if at all? Christopher, I read that letter too, and it is exactly the kind of misinformation I am referring to. One need not have even one ART in the study to know that it is safe. Anyone who knows what ART is and what its electrical circuits do, knows that it is safe to give adenosine. If you ask an electrophysiologist for an article on this, they will say "there are not article because this is so obvious that it needs no proof." The importance of that article is that adenosine is safe in VT. One need not prove that it is safe in ART. If I'm now understanding this correctly, the safety of adenosine in ART is because there is no automatic focus as the root cause. Blocking the re-entry circuit at the AV node is going to stop the tachycardia in its tracks because there is nothing left to sustain it. This is in contrast to AF where there is a constant source of atrial impulses ready to utilize the AP, happily settling on 1:1 conduction. Amiodarone does have AV nodal blocking properties, so I believe it is also contraindicated in Afib with WPW. I also agree with Amal Mattu's concerns with using Adenosine: occasionally adenosine works for VT in the literature. If it works, then what? Now cardiology isn't sure what to do with the patient: was it VT? Do they need an AICD? You are absolutely right about the amiodarone. I meant to remove that but forgot. Thanks. Adenosine only works for "adenosine sensitive v tach" that comes from the right ventricular outflow tract. It is always in a structurally normal heart. It is also very rare, and does not look like typical v tach. If the adenosine works, and the patient has a structurally normal heart, it wasn't adenosine sensitive v tach. The patient can of course also undergo an EP study before ever getting an AICD. hmm, in some ways, doesn't the marill paper put a dent in the oft-heard saying "wide and fast is VT until proven otherwise"? I haven't read it in a while, but as I remember, it doesn't contradict that. Nor does it support that saying. Because that's not, as I remember, what the paper was about; it was not an epidemiologic study nor purport be. Rather (again, as I remember it) it says what it tries to say: that even if it is VT, adenosine is safe. i just mean that the "proof" the saying refers to is the standard treatment for ART, and the saying inherently has lost some of its very rigid meaning. in the past, if we strictly adhere to that saying, adenosine would not even be considered in stable WCT since it's assumed to be VT, and, in a sense, using adenosine to differentiate SVT from VT would mean not assuming the WCT to be VT in the first place. 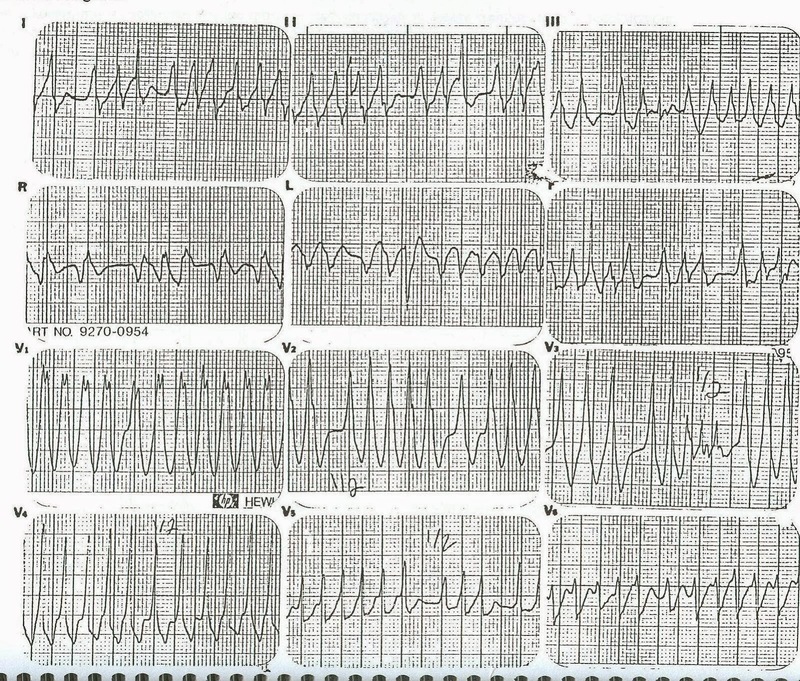 instead, past practices would assume the WCT is VT, and we'd give something other than adenosine. of course, if it didn't work, then what? maybe it's not VT? should we try something else? like adenosine? it's basically the opposite case. i'm just thinking silly thoughts. perhaps i'm just splitting hairs. I have seen variable literature on the effectiveness of adenosine to block retrograde conduction. The search is made more difficult by the fact that a majority of the literature is on AVNRT rather than AVRT. Is adenosine effective on blocking retrograde conduction? There is no difference between blocking retrograde and anterograde conduction. They are exactly the same physiology. This is also something that would not require a study to confirm. Great cases! I like the way they are presented, with the cases followed by the answers/discussion below. I think there are negative p waves in the first ECG (best visible in lead III), which makes AVRT most likely dx. You may well be correct about that! Interesting cases - thank you. We had a case of an 80 year old male presenting with probable VT (no clear AV dissociation/fusion etc), BP 130/70 and minor chest discomfort (presented 12 hours after onset). We prepped for cardioversion and tried adenosine 6mg and then 12 mg. There was no response to either (clinically or on ECG) Approximately 90 secs after the 12mg (while we finalized for the DC cardioversion) he arrested. Immediate cardioversion restored NSR at 60 with ischemic tombstone ST segments. Despite aggressive ACLS including tenecteplase in PEA, we were unable to get a ROSC. Coincidence seems unlikely. Comments re: timing with adenosine appreciated. Adenosine would be completely gone by 90 seconds, so it is hard to see how this is anything other than coincidence. Sounds like he died of an MI, not of any complication of adenosine. I am an emergency physician who also happens to get SVTs ! I wanted to share some peculiar aspects about my SVT. Since childhood, all my SVT episodes have been succesfully terminated using iv verapamil. However, couple of years ago, when I got an SVT after nearly a decade, the doctor decided to use adenosine which I had never had before. The first 6 mg dose had no effect other than bringing on the well known "impending doom" sensation. The second 12 mg dose did the following. 1. HR increased from 190 to 240 ! 2. Few seconds later, narrow complexes changed to broad complexes. 3. Few more seconds later, rythm changed to irregularly irregular ( AF). I remained conscious throughtout and fortunately, the AF lasted only for a few seconds before the original SVT rythm returned, again at 240 bpm. I then quietly asked for verapmil which did the job as usual. During a subsequent SVT episode, somehow, we decided to give adenosine another go in presence of a cardiologist and same sequence again ! Again, verapamil to the rescue. I have AVRT with a left atrial lateral wall accessory pathway that has eluded the ablation catheter probe thrice. I am still at a loss to explain this. Any thoughts ? Maybe you have verapamil sensitive fascicular VT? It's almost been 2 years since this post, so forgive my late arrival to the discussion. A study done in 1997 showed that about 12% of the patients who received adenosine for PSVT developed atrial fibrillation or atrial flutter in the immediate post-drug period. Both patients with AVRT and AVNRT were susceptible. Adenosine-induced atrial arrhythmia: a prospective analysis. I've been going over adenosine and WCT, provoked by some questions from my residents, and this post came up - very useful! Come across this post when reading your latest one. I have a question. Is WPW = AVRT ? I did some google search and it said that AVRT results in pre-excitation similar to WPW. So are they the same? And are you saying that if AVRT is present, yes adenosine can be given but when Afib happens in the setting of WPW, adenosine cannot be given. And the reason being that in Afib there is multiple foci while in AVRT there is only one atrial focus? AVRT is a type of arrhythmia that can be seen in WPW. It uses both the AV node and an accessory pathway, and goes either down the AV node and up the accessory (orthodromic) or down the accessory and up the AV node (antidromic - this is the wide one). WPW is a syndrome with an accessory pathway (a "Bundle of Kent" which is a bridge of myocardium across the otherwise insulating barrier between atria and ventricles). There are other syndromes which MAY cause AVRT: these would be Lown-Ganong-Levine syndrome and also EAVNC, or enhanced atrioventricular nodal conduction. I don't know much about these latter and they don't seem to have a lot of clinical significance. In other words, WPW does not = AVRT but is the underlying disease state of most AVRT. As for the second part of your question: adenosine can be given for AVRT (a regular tachycardia) but not for Atrial fib in WPW (an irregular tachycardia). In AVRT there is no focus: rather, there is an endless loop going from ventricle up through AV node to atrium then down through bypass tract to ventricle etc. If you just stop the loop at the AV node with adenosine, you stop it and let the sinus node take over. So could i say AVRT in the setting of WPW as the same of antidromic conduction of WPW? Did you mean to ask (two words confused me and I changed them): "So could i say that AVRT in the setting of WPW is the same as antidromic conduction of WPW?" Not exactly, because orthodromic AVRT is also due to WPW. Is it possible to have someone in a flutter/a fib with an underlying accessory pathway that is not being used? The reason I ask is because it is tough (?impossible) to differentiate a flutter 2:1 with ventricular response of 150 from orthodromic AVRT/AVNRT at 150 with an ECG, so whenever I see a regular narrow complex tachycardia at a constant 150 I cardiovert instead of giving adenosine. However, if they are hemodynamically stable and talking to me, is it 100% safe to give the adenosine, even if it is flutter 2:1? Some people use this adenosine "challenge" to clarify what is going on, and I just want to know if this really is completely safe. Adenosine is safe in flutter 2:1. It is only unsafe in atrial fib. so you can give adenosine if the rate is perfectly regular. Sir, Wouldnt atrial flutter with variable block also be irregularly irregular? No. The RR interval will always be a multiple of a whole number. That whole number is the flutter interval.